A beer has been launched to honour a ‘remarkable’ young man and his travel company which has gone on to celebrate 100 years in business. 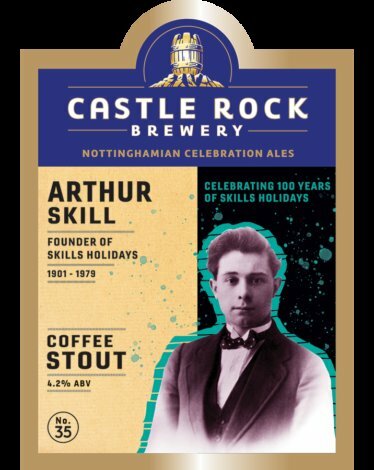 ‘Arthur Skill’ is a 4.2 per cent coffee stout which has been created by Castle Rock Brewery to celebrate a milestone year for Skills Coaches, which has grown to be one of the region’s largest tour companies. Arthur Skill, of Nottingham, was 19 in 1919, when he bought a fish lorry. It doubled as a people carrier to take workmen to places of employment including an industrial plant in Spondon, Derby. From the popularity of this service, so began Skills Coaches, the Nottingham based travel company that has since carried hundreds of thousands of travellers and holiday-makers to destinations across the UK and Europe. Last year alone it took 12,000 people to over 200 destinations. Now, Nottingham’s Castle Rock Brewery has honoured the legacy of Skills, by devising a new beer - the first Nottingham Celebration Ale of 2019. The launch of the beer brought about a surprise family reunion for two arms of the Skills family, during a tour to promote the beer. While Arthur built up the business, his brother, Hector, continued his recovery from injuries sustained in the Great War before going on to work in the family fish and chip business. Over the years, the two arms of the family lost regular contact, until news of the tour reached the Derby side. Rupert Skill, private hire sales manager at Skills and Arthur’s great-grandson, met with Nicholas, Arthur’s great nephew, his brother Tom, son Archie and their dad, another Arthur. "Now we're close, this is one family tie that'll certainly regrow," he added. The Skills' pub tour was organised by Castle Rock Brewery and took 57 loyal real ale fans to Derby, as a reminder of the original Skills route, and on to Loughborough and the Vale of Belvoir. At each pub, the coach tourists sampled 'Arthur Skill' marking the 100th anniversary of his firm, and celebrating this remarkable young man and his achievements.